I just tweeted that with sentiment suddenly so poorly we're going to need to see a quite horrific ISM Non Manufacturing figure to get to new lows on the day. Instead we saw an improvement as the figure reversed the recent trend of 'below expectation' in U.S. economic data - coming in at 54.6 in May vs 52.8 in April. (consensus 54.0) This is the larger part of the U.S. economy vs manufacturing so it's an actual positive. The employment subindex grew by 2.1, while prices fell by 0.5 - both positives. New orders also up in sharp fashion. 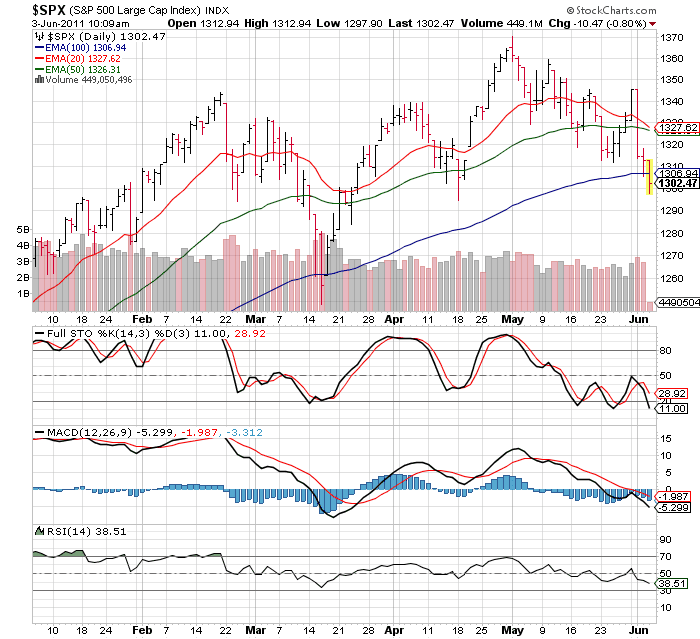 As for the market, we are quite stretched to the downside - at S&P 1300 the index is off 3.3% since the close Tuesday and most of the technical secondary indicators have quickly reached oversold levels. It's head spinning action as we jump from overbought to oversold within days. The 100 day moving average remains key at 1307; bulls would definitely like to see the S&P 500 close back above that level as this is the first intraday break of this average since March - and only the second such event since September 2010. I would be harvesting any short side gains here not pressing on the downside due to nothing else but the 'rubber band effect' - we've fallen a long way in 3 sessions and you are in danger of that cursory oversold bounce. If the S&P 500 fall to new lows on the day than you have to change course & re-engage on the short side. 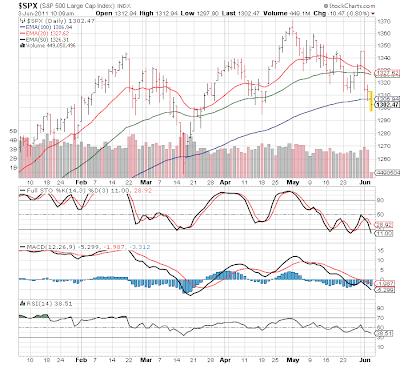 But that's very short term - we still appear to be in a bearish condition intermediate term.